LONDON (Reuters) - Britain's Prince Harry and his wife Meghan attended a play on Tuesday evening about the young Charles Darwin's 19th Century expedition on HMS Beagle, in aid of forest conservation. 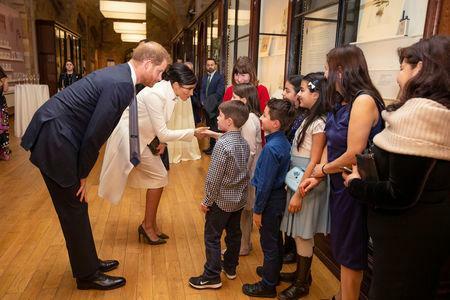 The Duke and Duchess Sussex were guests of honor at a gala performance of "The Wider Earth," staged at London's Natural History Museum in support of the Queen’s Commonwealth Trust and the production’s charitable partner, The Queen’s Commonwealth Canopy. The Canopy is a network of forest conservation initiatives that marks his grandmother Queen Elizabeth's service to the Commonwealth. "Planting trees and conserving forests helps us in so many ways," Harry said during the tour. "It is a simple, but effective way to restore and repair our environment." Darwin's five-year voyage around the world in the 1830s gave the young naturalist valuable insight into the natural world and helped influence his thinking as he prepared his ground-breaking work "On the Origen of Species."